The city of San Luis Obispo has selected the three dispensaries that will receive permits to operate marijuana shops in SLO, all three of which are major donors to the mayor and a pair of councilwomen. San Luis Obispo officials posted a notice on the city website Thursday saying the city issued contingent operator permits to Megan’s Organic Market, Natural Healing Center and Elemental Wellness. The permit for Elemental Wellness is contingent upon the dispensary selecting a site for its store within 60 days. Natural Healing Center is owned by local marijuana mogul Helios Dayspring and currently operates a dispensary in Grover Beach. The permit awarded for the Grover Beach dispensary has been the subject of separate pay-for-play allegations centered around Helios and a former mayor of the South County city. On Oct. 28, Dayspring and Natural Healing Center hosted a fundraiser for eight local politicians, including San Luis Obispo Mayor Heidi Harmon, Councilwoman Carlyn Christianson and now-Councilwoman Erica Stewart. Thousands of dollars were donated at the event to candidates for local office, including the trio currently seated on the SLO council. In her campaign finance disclosure forms, Harmon reported three donations from affiliates of Natural Healing Center, eight from affiliates of Megan’s Organic Market, and one from a minority owner of Elemental Wellness. Harmon also had four donations linked to SLO Cal Roots, one of the applicants that was not awarded a permit. 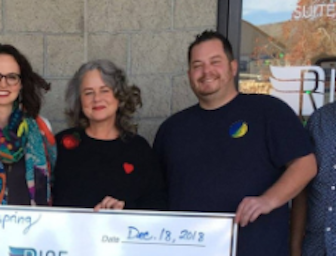 Stewart received donations from four affiliates of Natural Healing Center, three affiliates of Megan’s Organic Market, a minority owner of Elemental Wellness, and two affiliates of SLO Cal Roots. Christianson accepted donations from three affiliates of both Natural Healing Center and Megan’s Organic Market and a minority owner of Elemental Wellness. While Harmon, Christianson and Stewart each accepted multiple donations from people affiliated with the marijuana industry, those donors were generally listed on campaign finance forms as retired or under a non-marijuana related occupation. In response to questions about contributions she received in connection with Dayspring’s fundraiser, Harmon amended her 460 financial disclosures, removing multiple donations and all dates of donations, as well as five expenses. Just weeks after the Nov. 2018 election, Harmon and Christianson voted for a resolution establishing criteria for city staff to rank marijuana shop applicants. Stewart had not yet been sworn into office at the time. The city council resolution created a points system that appeared to favor applicants who donated money to Harmon, Christianson, and Stewart, particularly Dayspring. For instance, the scoring process awarded points for having a history of supporting local community programs. Dayspring’s Natural Healing Center has put on several community events, including gatherings for children, despite being a pot business. Megan’s Organic Market, owned by Megan Souza and Eric Powers, has functioned for several years as a local medical marijuana delivery service. After Cal Coast Times reported on the campaign contributions given by marijuana industry affiliates to local elected officials, Megan’s Organic Market owners called Cal Coast Times advertisers and threatened them in an attempt to get them to pull their advertising. Elemental Wellness is owned by Randolph Dale and Matt Quaglino, who have also operated a local medical pot delivery service. The three dispensaries SLO city officials selected beat out five other marijuana businesses that applied for a permit to operate a brick and mortar shop in SLO. The five marijuana businesses whose permit applications city officials rejected are: SLO CAL Roots, 805 Beach Breaks, Coastal Retail SLO, Harvest of San Luis Obispo and Hollister SLO. 805 Beach Breaks, which has a Grover Beach pot shop, last year became San Luis Obispo County’s first brick and mortar marijuana dispensary to open under California’s new cannabis legalization program. However, deputies and police officers from multiple agencies raided the Grover Beach marijuana store Thursday morning, and seized marijuana products related to an illegal grow in Los Alamos. Thursday’s notice on the city website also announced the recipient of one marijuana delivery service permit and one pot micro-business permit. Coastal Delivery SLO received the delivery permit, and Element 7 San Luis Obispo received the micro-business permit. City officials opted not to issue a permit to one non-storefront business, Lab Tested SLO. All of the permits awarded to the prevailing applicants are contingent upon the business owners passing background checks. Simply stunning that these council members feel it’s ok to take money from people whose campaign contributors are potentially being chosen for the lucrative position of a marijuana business. NONE OF THE campaign contributions should have EVER been made to the council members. It it looks like simply pay for play. And little old Morro Bay is caught up in this also? If they can’t pass their background checks they can arrange a simple pass by. Think Jussie Smollet.